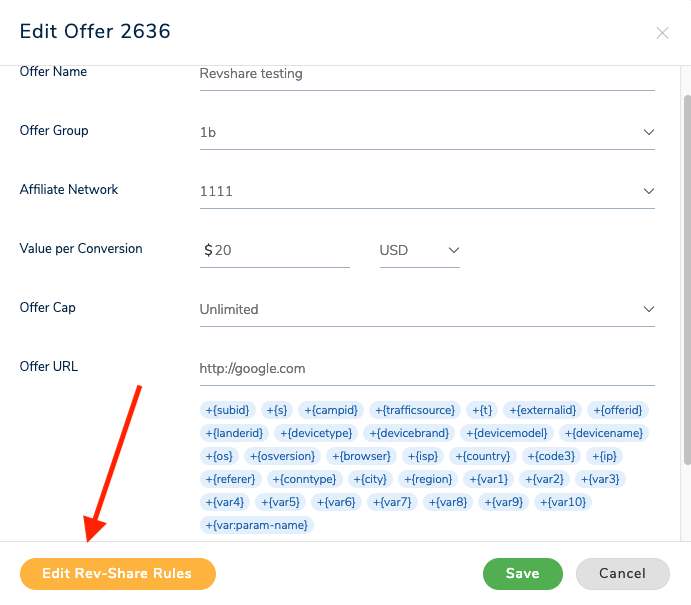 As of this week, our brand new rev-share feature has gone live. 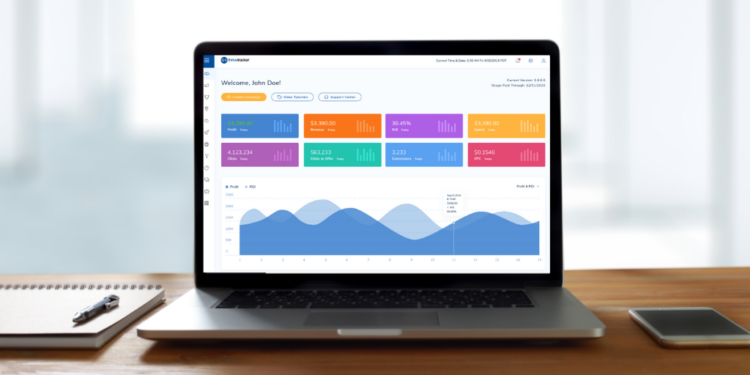 This incredible tool has many uses and benefits, especially for those of you who work in teams and want increased privacy regarding your revenue. 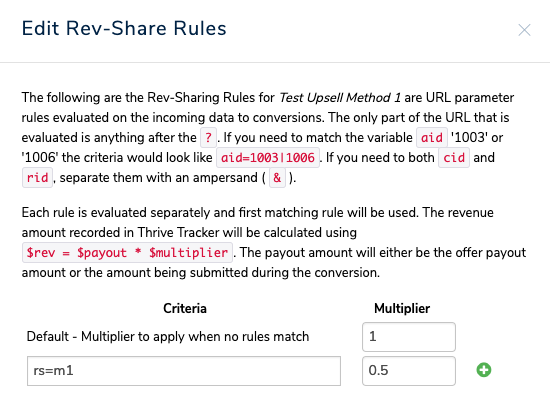 Setting up offers in Thrive using our rev-share rules allows our clients to reduce the visible revenue amount by a certain percentage when specific URL criteria are met. What does this mean? You get to control what others see as your revenue. This is especially beneficial if you need to set this up not only on the initial conversion, but in all conversion events, including upsells. We can now implement the rev-share percentage on any upsell events in your campaign flow that you want to track. So, at the heart of it, what is rev-share? 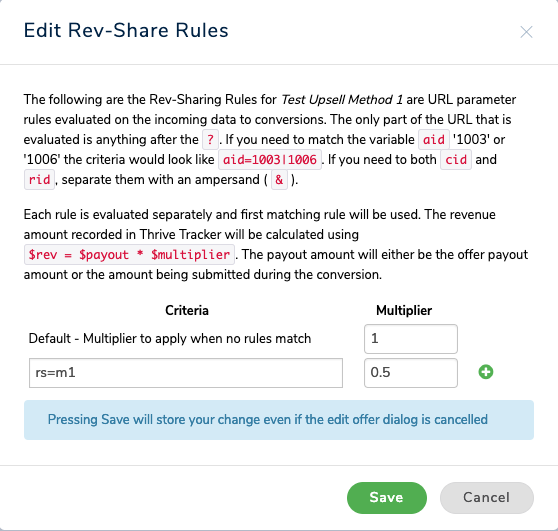 Essentially, rev-share helps you keep a portion of the total revenue private, reporting only the amount you specify to the source because you collect that remaining percentage. 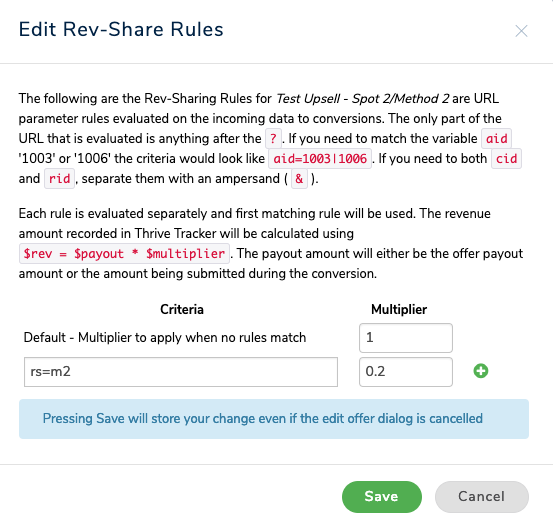 The criteria is where you can enter in a parameter and value that will be present in the postback in order for the rev-share rule to apply. The multiplier is the amount you want to apply to the payout amount in order to reduce the revenue logged in Thrive. In this example, we added rs=m1 as our criteria that needs to be present in the conversion via the postback url. If this criteria is present, it will apply the 0.5 multiplier to the payout amount. 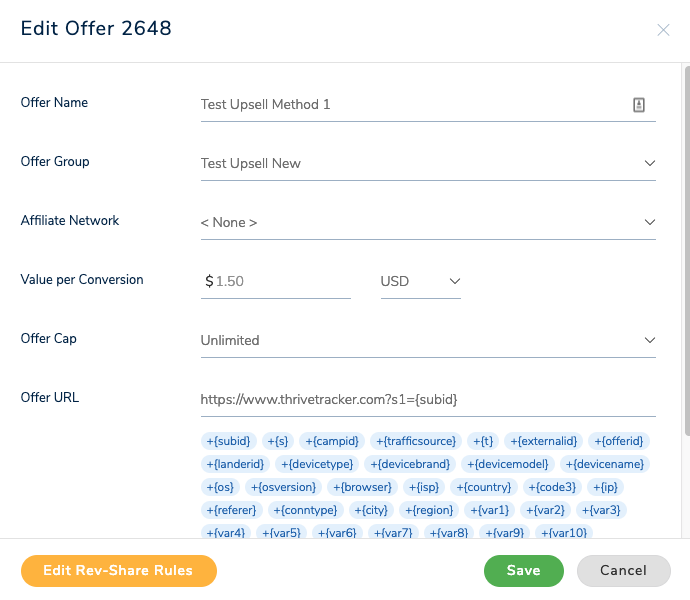 This method should be used when both the initial step 1 conversion and the upsell conversion are tracked under a single offer and single subID/conversion in Thrive, but with the total revenue reflected. Notice that we added in a tid= value on the upsell postback here. In order to track an upsell for Method 1, it’s required that there is a unique transaction ID (so that it differs from the step 1 conversion). Method 2 is used when you want to track step 1 as one offer and the upsell offer as a separate offer. This will allow you to track 2 conversions, each for the corresponding step. These are both added to our campaign rotation. Step 1 is set to active, while step 2 is set to inactive so that only the step 1 offer serves in the offer rotation (we wouldn’t want the upsell offer to serve before step 1, so setting it to inactive prevents this). Notice that offerid= is filled out here for the upsell. This is required for method 2 and must contain the Thrive offer ID of the upsell. Tid= is also filled out and is required for upsell tracking. As always, if you need any assistance or have questions, feel free to reach out to our amazing support team!